Happy Anniversary Edge & Morleigh!! June 18, 2003 marks the one year anniversay of The Edge's marriage to Morleigh. INSTEAD of strippers, the bachelor party for U2 guitarist The Edge featured supermodels. and gallons of Austrian wine. After dessert, Bono toasted the kitchen with a long speech. Dennis Hopper, Lenny Kravitz and REM star Michael Stipe. Exotic Garden of Eze, near where The Edge and Bono share a beachside villa. which attract tourists from all over the world. strictly private ceremony in a central Dublin registry office. It's also Paul McCartney's birthday the same day! U2 guitarist the Edge celebrated his marriage to longtime girlfriend Morleigh Steinberg in a Jewish ceremony over the weekend. The wedding, held in the south of France in the village of Eze-sur-Mer, was the culmination of a bond that was sealed at a private ceremony at a Dublin registry on June 18. A honeymoon destination was not known at press time. 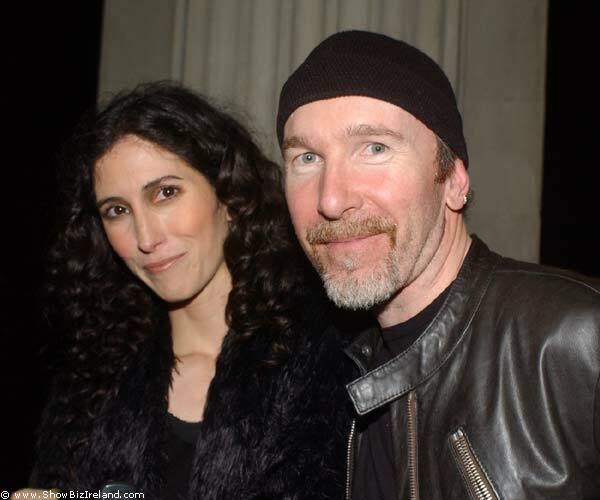 The Edge met Steinberg when the former belly dancer was hired to dance with U2 singer Bono for the Zooropa tour in the early '90s. Bono was the best man at the wedding and bandmates Adam Clayton and Larry Mullen Jr. were in attendance. Also helping to celebrate the union were R.E.M. singer Michael Stipe, supermodels Christy Turlington and Helena Christensen, Lenny Kravitz, and Dave Stewart. The couple has two children, 4-year-old Sian and 2-year-old Levi. The Edge divorced his previous wife, Aislinn O'Sullivan, in 1996. Cheers to the lovely couple! Not from the wedding but still cute.